The Audi Q7 is the flagship SUV from the German luxury brand, a 3-row/7-passenger hauler that deftly competes with the other 3-row midsize-crossover SUVs like the Infiniti QX60, Acura MDX and BMW X5. All-new just last year, the Q7 is packed with technology, prestige and dynamic driving manners, if not quite as much interior room as rivals. It is got enough room to tackle my day with my infant twins. I absolutely love my q7. Not only does it have enough space for myself and my two infants, I am able to haul everything around I need for my day. My seats are leather which makes clean up in the car a breeze. The entire car is electronic meaning there is not a traditional tach/speedometer. I like the fact that I can choose what I view: there's a different screen for if I need to make a phone call versus looking at nav versus looking at gas mileage. I could not ask for a better vehicle. No problems with this vehicle. It is very roomy, has great technology, has great performance and is extremely reliable. Comfort is key because we go on a lot of road trips, and this SUV is very comfortable for my family of 4. The features are all state-of-the-art. 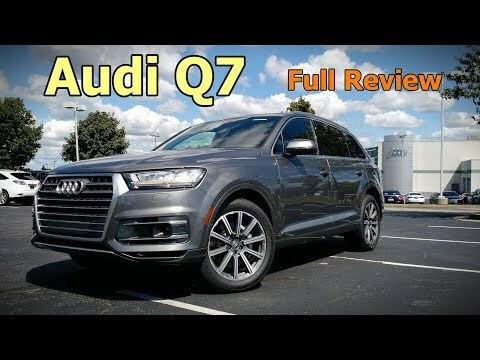 This is my second q7 and I have no complaints about them! A review of the biggest Audi large sedan that is available. There is nothing wrong with the Audi q7. We have had this car since the year of 2017 month of December and never had one problem with it. The technology in the car is unbeatable. The way the car drives is unbelievable, you cannot feel one bump on the road. That being said, it basically drives by itself.